Light up the Castle form the comfort of your own Castle! This shiny little Christmas Village has all of our Disney Faves decorating their happy little Christmas cove! The Princesses are decking out the tree, the Mice are rolling up a snowman, and Pooh and his Friends get jiggy on the ice! But the BEST part is the Cinderella Castle in the background lights up! The cove lights up from underneath, too! 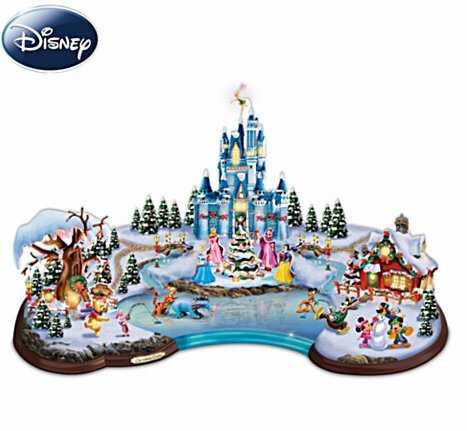 Check out our other Favorite Disney Snow Village Pieces that would go perfectly with this great scene! I like that this is sort of an all in one village scene. This may be just what I need to kick off my collection.